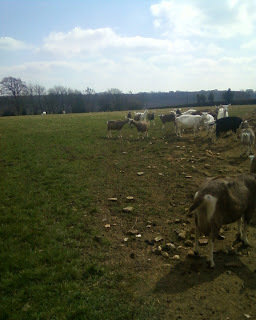 Even though it was very chilly today, many of the big girls went for a stroll around in the field. I think the brief spell of sunshine encouraged them all to go outside for a breath of fresh air. The girls were all very pleased to see their Auntie Fran, especially as she had brought 3 huge bags of bananas with her! Right .. I'm back off to my caravan to see what those two little people are up to. Probably just asleep in their box!